Ucom offers new prepaid tariff plans for everyone with different preferences. Join Ucom new U!1000, U!1500, U!2000 or U!3000 prepaid tariff plans and get plenty of minutes to call all local networks, a lot of internet and SMS to any local number. “This offer is mainly for those customers who don’t want to count to whom do they call or how much do they use mobile internet. They will just remember a monthly fee and fit in it. This offer is suitable both for those customers who prefer to make calls within Ucom mobile network and for those who make calls to all local networks”, mentioned Hayk Yesayan, Ucom Director. 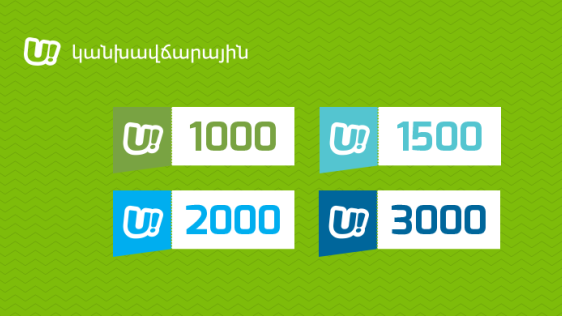 By joining U!1500 tariff plan subscribers will get 100 minutes to all local networks and Artsakh, 1 GB of high-speed internet, as well as 150 SMS. U!2000 tariff plan subscribers will get 150 minutes to all local networks and Artsakh, 1,5 GB of high-speed internet and 200 SMS. The subscribers of U!3000 tariff plan will get 200 minutes to all local networks and Artsakh, 3 GB of high-speed internet and 300 SMS. If you mostly call within Ucom mobile network, U!1000 tariff plan will be the best choice for you. It offers 1000 minutes in Ucom mobile network, 100 MB of high-speed internet and 100 SMS. Moreover, customers can call within Ucom mobile network at 0 AMD/minute rate after the minutes’ inclusion is over till the end of inclusion’s validity period. U!3000 tariff plan is for those customers, who mainly use mobile internet, while U!1000 tariff plan is very suitable for calls in Ucom mobile network. U! tariff plans are about freedom and convenience. The subscribers are free to change the tariff plan by simply dialing a corresponding short code for the preferred one. Tariff plan inclusions are valid within 30 days. After 30 days the inclusions will be reactivated automatically.